Here at Fox we rent just about everything. Below is our rental price list. A one day rental consists of a 24hr period, so if you get the rental at 12pm Monday it will be due back at 12pm on Tuesday. We only rent the BEST quality gear. Our motto is if any of us in the shop wouldn't ride it why would we want our customers to rent it. You won't see any Bic or NSP's in our rental fleet. All our surfboards and SUP's are lightweight state of the art composites that not only have the duribilty to hold up in a rental fleet but also have the performance that any skill level can enjoy. Our windsurfing gear consists only of Ezzy Sails along with JP Australia boards as well as some of our old school Fox Customs for those EXTREME High wind days. Feel free to give us a call or email if you have any other questions about our rentals. 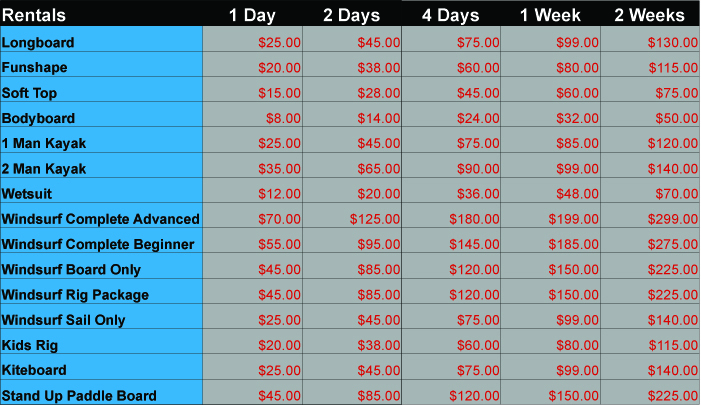 Or if you want to prebook your gear before you get here you can click on the Rentals tab on the blue menu bar above. All prebooked rentals receive a 10% discount. We offer surfboard rentals in cape hatteras nor carolina. We have stand up paddle board rentals. SUP rentals offered in hatteras nc. Surfing rentals in the outer banks. Windsurfing rentals in cape hatteras. Surfing rentals in the outerbanks. Surfboard rentals in Buxton, NC. Surfboard rentals and lessons in Cape Hatteras. Surfing Lessons in Cape Hatteras. Surf rentals in Cape Hatteras. Hatteras SUP rentals. Stand Up Paddle Board Rentals in the outerbanks. SUP rentals on Hatteras Island. Discount rental gear on the outerbanks. Discount surfboard rentals in cape hatteras. Cape Hatteras discount rental surfboards. Surfing rentals at a discount on the outerbanks of north carolina. We have SUP rentals Stand Up Paddle rentals and Kayak rentlas as well as surfboard rentals. Longboard rentals on the outerbanks. If you are looking for rentals on the outerbanks we are the number place for SUP Surfboard Kayak and kiteboarding and windsurfing gear. Hatteras kiteboarding rentals. outerbanks kiteboarding rentals. Hatteras windsurfing rentals. Cape hatteras windsurfing rental gear. Kitesurfing rentals on the outerbanks. Cape hatteras kitesurfing rental gear. Rental Wainman Kiteboarding gear.